The bedbugs keep biting, and the reputations and pocketbooks of hotels and inns are getting infected.A couple of months ago we did a â€œtrending spottingâ€ piece on bedbugs, and the fact they were driving travelers and hotels management mad. The bedbugs keep biting, and the reputations and pocketbooks of hotels and inns are getting infected. A couple of months ago we did a “trending spotting” piece on bedbugs, and the fact they were driving travelers and hotels management mad. Now bedbug mania is front page, main stream news, with the Boston Globe headlining a piece on the critters. The pests have an uncanny ability to hide in mattresses and crevices in bed coverings. They’re also amazingly adept travelers, hitching rides on luggage and striking fear into the hearts of hotel management from the most modest inn to the most luxurious hotel anywhere, USA. 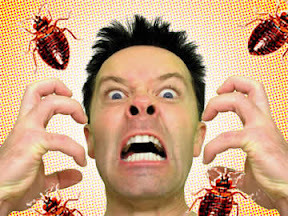 It seems disgruntled guests, ones bitten by bedbugs or those who just thought they were, are quick to post their bad experiences on Trip Advisor, causing Paul Sacco, CEO of the Massachusetts Lodging Association to lament that a single bedbug posting can “bring an establishment to its knees,” and he notes such complaints are often difficult to substantiate. Now comes, of all things, The Bedbug Registry which gathers info about bed bug sightings in apartments and hotels, and Terminix, according to Reuters has just released its “Infestation List” showing, no surprise, that New York ranks number 1 in bedbug infestation of all US cities. Boston is 15th. One entomolgists says the nationwide bedbug problem is the worst he’s seen because of the decline in DDT use, and the increase in international travel. • • Don’t unpack anything in a hotel room, says a pest and wildlife manager. Don’t use hotel luggage racks either. • • At home, unpack suitcases outside, in the garage. Seal clothes in a plastic bag and wash them in hot water. • • Putting a pesticide strip in luggage helps. Bedbugs are an equal misery spreader, and those who have been bitten are keeping good company. Reuters reports that former U.S. President Bill Clinton has battled an outbreak at his Harlem office, along with lingerie outlet Victoria’s Secret, teen clothing store Hollister and countless hotels which have lost thousands of dollars in revenue fighting the bedbugs.